...but it will take a little longer. 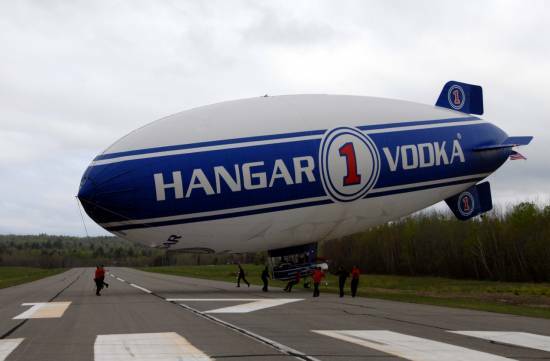 Recently the blimp Hanger 1 Vodka while flying from Canada, where it was made, to Orlando Florida took a small break. One of the trucks traveling with the blimp needed repairs. As a result the blimp landed at the small airstrip in Lincoln Maine. The weather at the time was kind of miserable; wet and cool. After two days the truck was fixed, and the weather turned sunny and warmer (one day only) so the crew took advantage and lifted off. 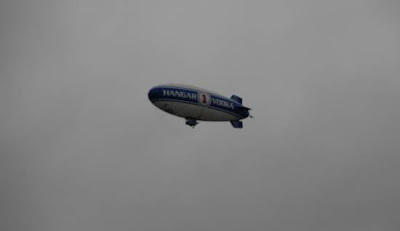 Shortly after departure from Lincoln the weather rapidly deteriorated becoming foggy and wet and cold; the blimp had to land, this time at a small strip in Pittsfield Maine; they had traveled about sixty miles, or less. Four days later the weather turned better for a couple of days and the blimp left Pittsfield and headed south. We haven't heard from it since, but I think they made it to their destination. 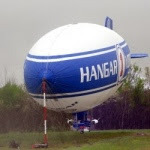 leaving, the blimp is 150 feet long and 60 feet high. On the ground with it's mast, or tether, the mast travels on one of the trucks. ﻿﻿Here's a note on yesterday's entry: The Nash Island sheep's wool is highly prized because it is constantly "washed" by the fog, therefore it's impecably clean. Isn't that nice to know?